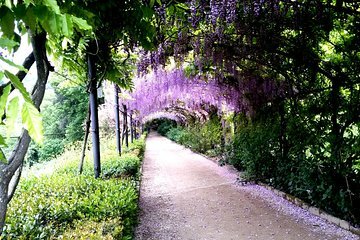 Escape the bustle of Florence with this private 2-hour gardens tour. Visit the lush green spaces of the Villa Bardini Gardens and Boboli Gardens with a guide. Meet your guide near the entrance of the Bardini Gardens in the Oltrarno neighborhood of Florence. From the river, the Oltrarno goes from residential city streets up into green hills, and there are two large garden spaces in the inner part of the neighborhood, too. The Giardino Bardini is less well known than the Boboli Gardens, which are behind the Palazzo Pitti. The Boboli Gardens cover more than 45,000 square meters, and were built to surround the Medici's new family home – the Palazzo Pitti. It's one of the finest examples of an Italian garden, with sculptures and grottoes to explore, as well as an amphitheater and fountains. Learn about the plants grown here, including fruit trees and vegetables – this was, for instance, the first garden in Italy to grow potatoes. Explore the lesser-known Bardini Gardens to soak in the verdant surroundings. Enjoy the expanse of roses, azaleas, camellia, hydrangea, and a showy wisteria. This garden also offers an excellent view over the city.